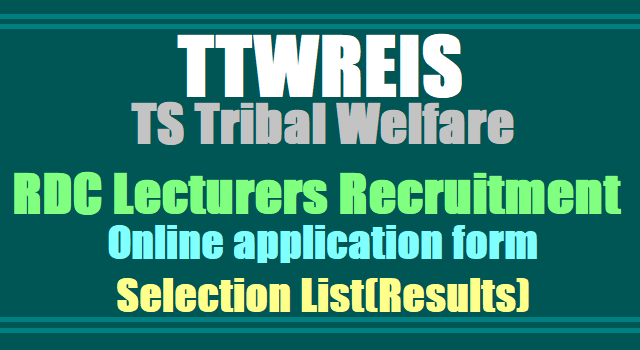 TTWREIS Guest Faculty / Part time Lecturers, TTwreis Degree Colleges Lecturers recruitment 2018 Online application form- TS Tribal Welfare Degree Colleges /TTWRDC GUEST FACULTY / PART TIME LECTURER RECRUITMENT 2018-19 : Online Application for Guest faculty/Part time Lecturers of TSTWREIS Degree Colleges for 2018-18, Notification for Guest Faculty/Part time Lecturers of TTWREIS Degree Colleges for 2018-18. TTWREIS Degree Colleges Lecturers recruitment 2018, TTWREIS Degree Lecturers recruitment 2018 in TTWRDCs-application form: TTWRDC Degree Colleges Lecturers recruitment, TTWRDC Teaching Staff Guest faculty, TTWREIS Teaching Posts recruitment,application form, last date for apply and eligibility criteria details given here: Telangana Tribal welfare Educational Institutions Society has published TTWRDC Degree Lecturers Recruitment notification and applications are invited from the qualified and interested candidates to work on temporary basis as full time guest faculty in TS Tribal welfare Residential Degree Colleges in the newly sanctioned vacant posts for the Academic year 2018-19. The above sanctioned colleges are functioning from the academic year 2017-18. The said colleges have the following groups viz.M.P.C, M.P.CS, B.Z.C, B.Z.Microbiology, B.Z. biotechnology, B.com(general), B.Com(computers), B.A.(H.E.P.) and B.A. (H.E.Geography). Appointment of Guest lecturers/ part time Lecturers is based as per the need in the colleges. 1) Telugu 2) English 3) History 4) Economics 5) Political Science 6) Mathematics 7) Physics 8) Chemistry 9) Statistics 10) Computer Science 11) Electronics 12) Botany 13) Zoology 14) Micro Biology 15) Bio Technology 16) Commerce. 1.Candidates having Masters Degree (i.e., M.A / M.Sc / M.Com./ M.C.A./M.Sc. (comp.)) with a minimum of 55%, in case of SC/ST, 50% of marks in the relevant Subject are eligible to apply. 2. Retired Lecturers from Degree/ Jr. Colleges can also apply. 3. NET/SET, M.Phil and Ph.D. holders will be given preference. a). Weightage for Post Graduation - 50% weightage would be given for marks secured in P.G. - Candidates with NET/SET, M.Phil and Ph.D. shall obtain 30 marks for the additional qualifications. "Online Application for Guest faculty of TTWREIS Degree Colleges for 2018-19 extended upto 28-08-2018........"
3. Date of Demo/interview -.... (Candidates shall be intimated through SMS).